I hope you’ve been enjoying my coverage of British Flowers Week 2016 on Flowerona. 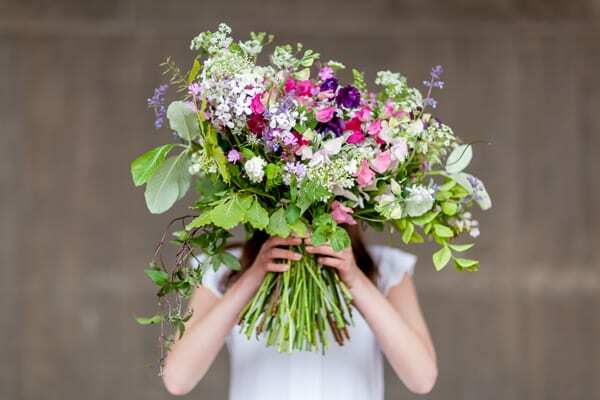 If you’re UK based and watched Countryfile last night, you may have not only heard this annual celebration of homegrown blooms mentioned, but also seen Ellie Jauncey and Anna Day from The Flower Appreciation Society? Well, just in case you missed the programme, here’s a link. You’ll also see footage of Rosebie Morton from The Real Flower Company, plus Graeme from Zest Flowers and Mick from Pratley at New Covent Garden Flower Market. It’s Day Four and I’m delighted to feature an exclusive interview with Ellie and Anna. Your chosen flower for British Flowers Week is summer foliage. Could you tell us why you selected it? We love foliage! As soon as we arrive at New Covent Garden Flower Market, the first place we go to is GB Foliage. At the moment, there’s so much variety such as guelder rose, weigela and flowering viburnum. Plus non-flowering foliage wise, there’s birch, copper beech, beech, white leaf, mint and grasses. The main traders we buy from are GB Foliage, Zest Flowers and Pratley. At Zest, you never know what you’ll find in their British flowers section. There’s always something different! We’ve made three designs. For our mantelpiece design, we used a colour palette of white and purple, combined with a lovely assortment of foliage. Flowering viburnum, white leaf, beech, privet and birch formed the foliage element. And the flowers included alliums, cornflowers, sweet rocket, orlaya grandiflora, delphiniums and sweet peas. 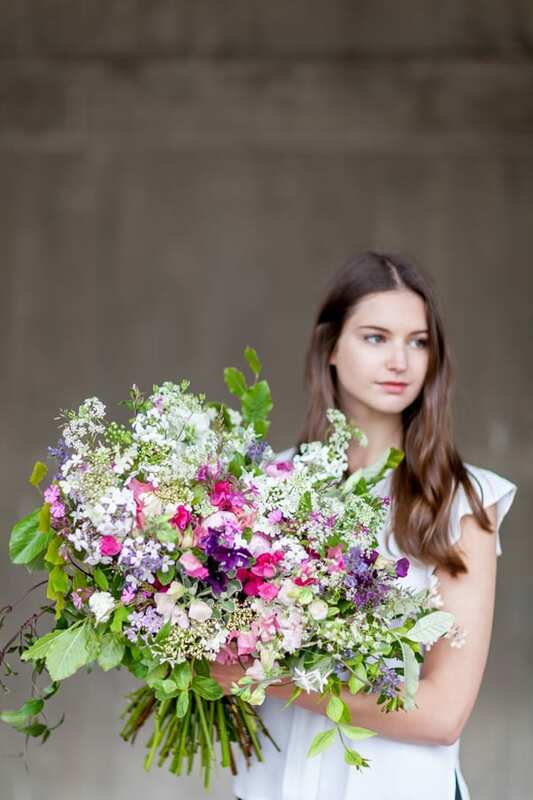 Our bouquet design featured privet, birch, white leaf, beech, flowering viburnum, mint, senecio, trailing jasmine, campion, stocks, orlaya grandiflora, sweet rocket, nepeta and sweet peas. 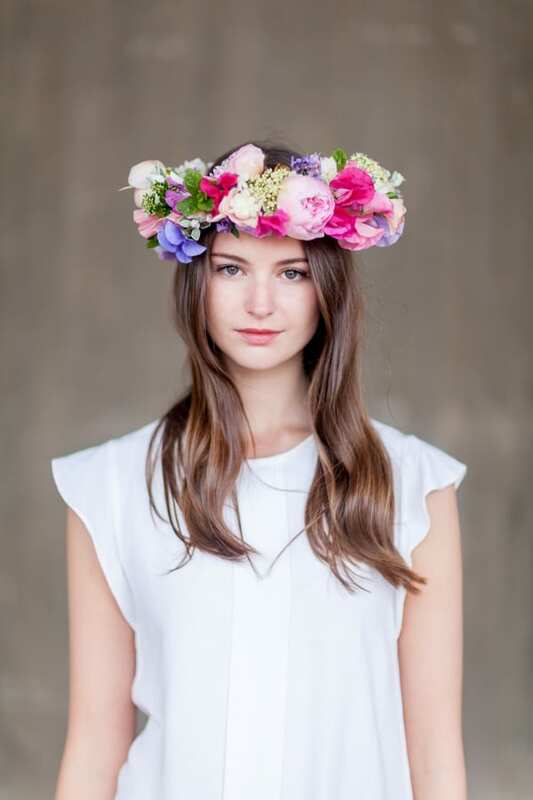 Whilst our floral crown was brimmed full of sweet peas, campion and peonies, complemented with mint, flowering viburnum and mint. 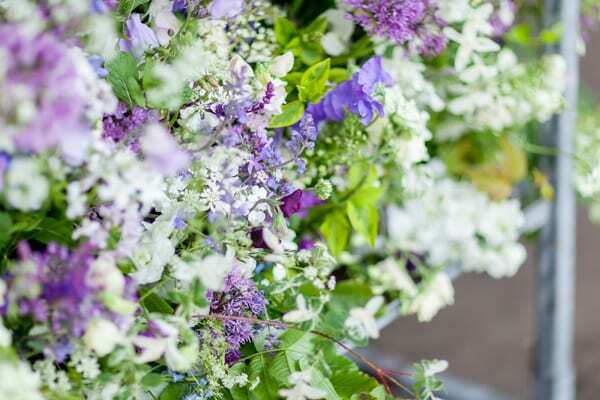 Why do you love British flowers and foliage? We love them, not only because of ethical reasons, the fact that they’re not flown in and buying them supports the local economy, but also because they feel so different from imported flowers. Even the foliage feels different. They’ve got more bounce, more life to them. We quite like their imperfections. Also, it’s not so much the quantity, but their quality that’s important. You don’t need a lot to change the style of a design…just a couple of stems of British flowers will make a difference. In our book, The Flower Appreciation Society – An A to Z of All Things Floral, we’ve even dedicated a whole chapter to English (British) Flowers! There’s almost nothing more wonderful than having to wait for things each season. Like the first sweet peas. We love the transient nature of British flowers. And when they’re in season, they’re really good value for money. That’s the perfect reason why you should buy them in season. And we use them then in abundance. The peak months for us are April through to October, when there are lots of weddings and events. The season starts with sweet peas, then moves on to peonies, followed by delphiniums, stocks and Solomon’s seal. Actually, we get a bit patriotic about using British flowers and foliage. However, we want to be clear…we do supplement our designs with imported blooms, when British flowers aren’t available. Not necessarily. They tend to come to us for the overall look of our designs. Lots of customers ask for seasonal flowers. However, we have created floral designs for funerals when they’ve specified British flowers. Brides trust us to choose their flowers. They show us a colour palette and we’ll write a list of flowers which may be available. But we never promise something specific. Then, in the days running up to the wedding, we like to come to the Market and see what’s available, and when possible, we’ll buy British. Their seasonality. It can be a double-edged sword as availability is so dependent on the weather. P.S. 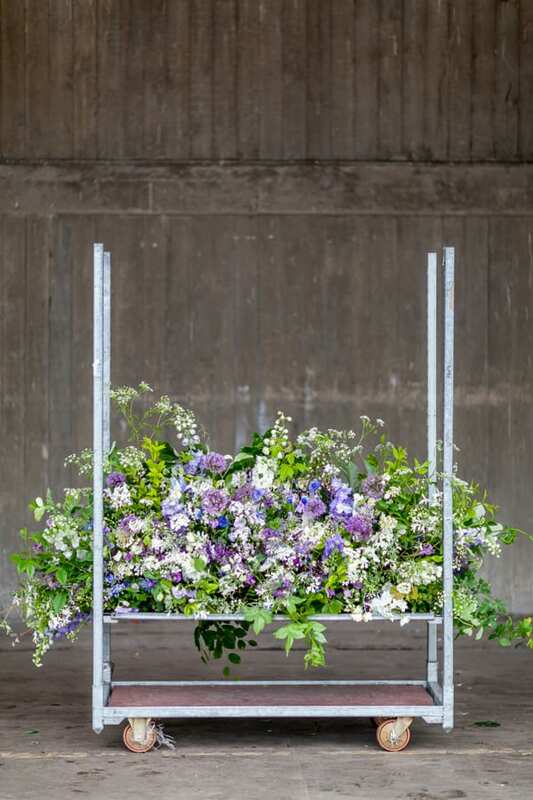 Just in case you missed them, here are links to Day One, Day Two and Day Three of British Flowers Week.